"AJAX" redirects here. For other uses, see Ajax. In the early-to-mid 1990s, most Web sites were based on complete HTML pages. Each user action required that a complete new page be loaded from the server. This process was inefficient, as reflected by the user experience: all page content disappeared, then the new page appeared. Each time the browser reloaded a page because of a partial change, all of the content had to be re-sent, even though only some of the information had changed. This placed additional load on the server and made bandwidth a limiting factor on performance. In 1996, the iframe tag was introduced by Internet Explorer; like the object element, it can load or fetch content asynchronously. In 1998, the Microsoft Outlook Web Access team developed the concept behind the XMLHttpRequest scripting object. It appeared as XMLHTTP in the second version of the MSXML library, which shipped with Internet Explorer 5.0 in March 1999. Google made a wide deployment of standards-compliant, cross browser Ajax with Gmail (2004) and Google Maps (2005). 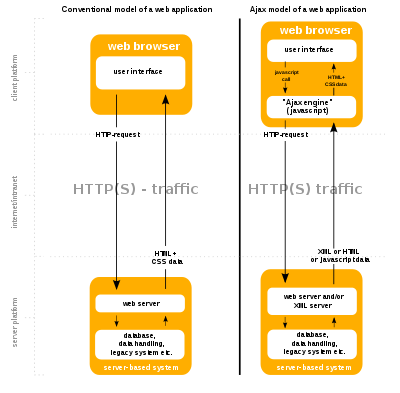 In October 2004 Kayak.com's public beta release was among the first large-scale e-commerce uses of what their developers at that time called "the xml http thing". This increased interest in AJAX among web program developers. The term Ajax was publicly used on 18 February 2005 by Jesse James Garrett in an article titled Ajax: A New Approach to Web Applications, based on techniques used on Google pages. On 5 April 2006, the World Wide Web Consortium (W3C) released the first draft specification for the XMLHttpRequest object in an attempt to create an official Web standard. The latest draft of the XMLHttpRequest object was published on 06 October 2016. Similarly, some Web applications that use Ajax are built in a way that cannot be read by screen-reading technologies, such as JAWS. The WAI-ARIA standards provide a way to provide hints in such a case. Screen readers that are able to use Ajax may still not be able to properly read the dynamically generated content. The same-origin policy prevents some Ajax techniques from being used across domains, although the W3C has a draft of the XMLHttpRequest object that would enable this functionality. Methods exist to sidestep this security feature by using a special Cross Domain Communications channel embedded as an iframe within a page, or by the use of JSONP. The asynchronous callback-style of programming required can lead to complex code that is hard to maintain, to debug and to test. Because of the asynchronous nature of Ajax, each chunk of data that is sent or received by the client occurs in a connection established specifically for that event. This creates a requirement that for every action, the client must poll the server, instead of listening, which incurs significant overhead. This overhead leads to several times higher latency with Ajax than what can be achieved with a technology such as websockets. In pre-HTML5 browsers, pages dynamically created using successive Ajax requests did not automatically register themselves with the browser's history engine, so clicking the browser's "back" button may not have returned the browser to an earlier state of the Ajax-enabled page, but may have instead returned to the last full page visited before it. Such behavior — navigating between pages instead of navigating between page states — may be desirable, but if fine-grained tracking of page state is required, then a pre-HTML5 workaround was to use invisible iframes to trigger changes in the browser's history. A workaround implemented by Ajax techniques is to change the URL fragment identifier (the part of a URL after the "#") when an Ajax-enabled page is accessed and monitor it for changes. HTML5 provides an extensive API standard for working with the browser's history engine. Dynamic Web page updates also make it difficult to bookmark and return to a particular state of the application. Solutions to this problem exist, many of which again use the URL fragment identifier. On the other hand, as AJAX-intensive pages tend to function as applications rather than content, bookmarking interim states rarely makes sense. Nevertheless, the solution provided by HTML5 for the above problem also applies for this. Depending on the nature of the Ajax application, dynamic page updates may disrupt user interactions, particularly if the Internet connection is slow or unreliable. For example, editing a search field may trigger a query to the server for search completions, but the user may not know that a search completion popup is forthcoming, and if the Internet connection is slow, the popup list may show up at an inconvenient time, when the user has already proceeded to do something else. console.log('Error: ' + xhr.status); // An error occurred during the request. // This is the server-side script. // Set the content type. // Send the data back. Many developers dislike the syntax used in the XMLHttpRequest object, so some of the following workarounds have been created. jQuery also implements a 'get' method which allows the same code to be written more concisely. ^ a b c Jesse James Garrett (18 February 2005). "Ajax: A New Approach to Web Applications". AdaptivePath.com. Retrieved 19 June 2008. ^ "Ajax - Web developer guides". MDN Web Docs. Retrieved 27 February 2018. ^ a b Ullman, Chris (March 2007). Beginning Ajax. wrox. ISBN 978-0-470-10675-4. Archived from the original on 5 July 2008. Retrieved 24 June 2008. ^ a b "Article on the history of XMLHTTP by an original developer". Alexhopmann.com. 31 January 2007. Archived from the original on 23 June 2007. Retrieved 14 July 2009. ^ "Specification of the IXMLHTTPRequest interface from the Microsoft Developer Network". Msdn.microsoft.com. Retrieved 14 July 2009. ^ Dutta, Sunava (23 January 2006). "Native XMLHTTPRequest object". IEBlog. Microsoft. Retrieved 30 November 2006. ^ "Dynamic HTML and XML: The XMLHttpRequest Object". Apple Inc. Retrieved 25 June 2008. ^ Hopmann, Alex. "Story of XMLHTTP". Alex Hopmann’s Blog. Archived from the original on 30 March 2010. Retrieved 17 May 2010. ^ "A Brief History of Ajax". Aaron Swartz. 22 December 2005. Retrieved 4 August 2009. ^ English, Paul. "Kayak User Interface". OFFICIAL KAYAK.COM TECHNOBLOG. Retrieved 22 May 2014. ^ a b van Kesteren, Anne; Jackson, Dean (5 April 2006). "The XMLHttpRequest Object". W3.org. World Wide Web Consortium. Archived from the original on 16 May 2008. Retrieved 25 June 2008. ^ Kesteren, Anne; Aubourg, Julian; Song, Jungkee; Steen, Hallvord R. M. "XMLHttpRequest Level 1". W3.org. W3C. Retrieved 19 February 2019. ^ "Speed Up Your Ajax-based Apps with JSON". DevX.com. Archived from the original on 4 July 2008. Retrieved 4 July 2008. ^ Quinsey, Peter. "User-proofing Ajax". ^ "WAI-ARIA Overview". W3C. Archived from the original on 26 October 2010. Retrieved 21 October 2010. ^ Edwards, James (5 May 2006). "Ajax and Screenreaders: When Can it Work?". sitepoint.com. Retrieved 27 June 2008. ^ "Access Control for Cross-Site Requests". World Wide Web Consortium. Archived from the original on 14 May 2008. Retrieved 27 June 2008. ^ "Secure Cross-Domain Communication in the Browser". The Architecture Journal (MSDN). Archived from the original on 29 March 2010. Retrieved 27 April 2010. ^ Cuthbertson, Tim. "What is asynchronous programming, and why is it so damn awkward?". GFX Monk. Retrieved 19 October 2010. ^ "Selenium documentation: Fetching a Page". Selenium. Retrieved 6 October 2011. It is worth noting that if your page uses a lot of Ajax on load then WebDriver may not know when it has completely loaded. If you need to ensure such pages are fully loaded, then you can use Explicit and Implicit Waits. ^ Pimentel, Victoria; Nickerson, Bradford G. (8 May 2012). "Communicating and Displaying Real-Time Data with WebSocket". Internet Computing, IEEE. 16 (4): 45–53. doi:10.1109/MIC.2012.64. ^ a b "Why use Ajax?". InterAKT. 10 November 2005. Archived from the original on 29 May 2008. Retrieved 26 June 2008. ^ a b "Deep Linking for AJAX". ^ a b "HTML5 specification". Retrieved 21 October 2011. ^ Hendriks, Erik (23 May 2014). "Official news on crawling and indexing sites for the Google index". Google. Retrieved 24 May 2015. ^ Prokoph, Andreas (8 May 2007). "Help Web crawlers efficiently crawl your portal sites and Web sites". IBM. Retrieved 22 April 2009. ^ "Deprecating our AJAX crawling scheme". Google Webmaster Central Blog. 14 October 2015. Wikimedia Commons has media related to AJAX (programming).